Jakarta, Aug 19 (PTI) Battling an identity crisis in India, the Greco Roman style of wrestling has taken a few steps in improving its image but desperately seeks a big medal for a complete make-over. Noida Aug 19 (ANI): Fashion and style is something which is difficult to keep up with, but according to Bollywood actress Vaani Kapoor it is all about comfort and confidence. Mumbai, Aug 19 (PTI) Kajol believes despite being a part of major commercial films, she successfully managed to avoid getting trapped into a particular image and it has held her in good stead with the audiences. New Delhi, Aug 19 (PTI) No ATM will be replenished with cash after 9 pm in cities and 6 pm in rural areas from next year even as two armed guards will accompany crisp notes in transit as per a new directive issued by the Home Ministry. 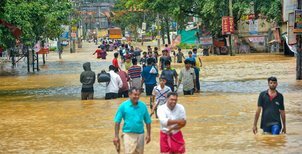 Thiruvananthapuram, Aug 19 (PTI) Thousands of people in flood-hit areas in Kerala are battling all odds to survive as the death toll has touched 197 in the past 10 days in the second spell of monsoon fury since August 8. New Delhi Aug 19 (ANI): President Ram Nath Kovind paid floral tributes to Dr Shankar Dayal Sharma, former President of India, on the occasion of his birth anniversary at Rashtrapati Bhavan on Sunday. Haridwar Aug 19 (ANI): The ashes of former prime minister Atal Bihari Vajpayee immersed in Ganga river at Har-ki-Pauri in Haridwar on Sunday.